It is important to note that, due to the similarity in their names, there is occasional confusion in the literature between Eriochloa polystachya and Echinochloa polystachya (German grass, pasto aleman) which is an aquatic grass species and a weed. Carib grass (Eriochloa polystachya H.B.K.) is valuable pasture grass native to northern South America and the Caribbean. Eriochloa polystachya is an annual or perennial stoloniferous grass, growing to a height of 2 m. Its culms are coarse (13 mm in diameter), straight in young plants and decumbent at maturity. Carib grass roots from the lower nodes and its root system is relatively shallow. Carib grass is pubescent at the nodes and leafy. Leaves are alternate and the blades are glabrous or pubescent, flat, linear, 6-28 cm long x 6-18 mm wide. Inflorescences are open panicles borne at the end of the culms. The spikes (5-18) are 2-6 cm long, spreading or ascending. 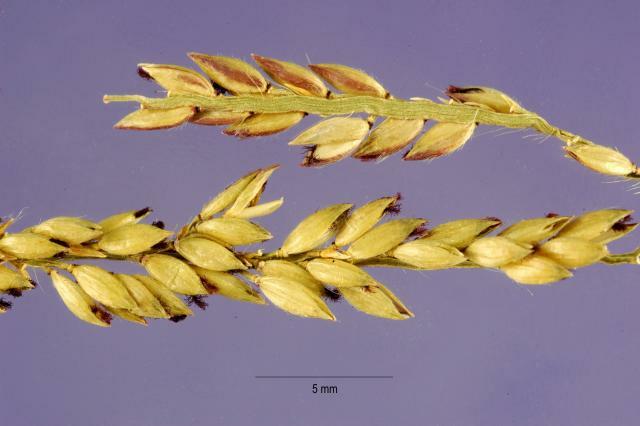 The spikelets are 3.2-3.9 mm long, lanceolate to ovate in shape, pubescent and have a distinctive purple point at their base (Shaw et al., 2007; Quattrocchi, 2006; Clayton et al., 2006). Carib grass is very similar to, and often mistaken for, Para grass (Brachiaria mutica), though it has thinner and shorter culms, shorter panicles and more abundant, darker and broader leaves (Rodriguez-Carrasquel, 1983). They are difficult to distinguish in the absence of inflorescences. Para grass and carib grass frequently grow together, are similar in their growth habits and environmental requirements, and often crowd out all other grasses on poorly drained soils (Kretschmer et al., 2001). Carib grass is considered to be valuable forage. Carib grass can be grazed or cut for green chop, hay or silage (Skerman et al., 1990). However, it is primarily described as a pasture grass in the literature. Eriochloa polystachya is thought to originate from the Caribbean Islands and the northern countries of South America. It is naturally found in Costa Rica, Honduras, Mexico, Brazil and Colombia. It was introduced into the USA (Florida and Texas) in 1914, in Venezuela in the 1950s and in Australia in the 1970s (Thompson, 1921; Shaw et al., 2007; Skerman et al., 1990). Carib grass is cultivated in areas where temperatures and moisture are high (Shaw et al., 2007; Skerman et al., 1990). Carib grass is found in both hemispheres, from 24°N to 20°S, and from sea level up to an altitude of 1800 m. It grows well in humid areas and wet, fertile tropical soils, with a preference for sandy loams. It does well on river banks and waterlogged soils but has low tolerance of dry conditions and low fertility soils (Skerman et al., 1990; Rodriguez-Carrasquel, 1983). Some cultivars tolerate acidic soils and flooding (Skerman et al., 1990). It can grow in association with Para grass (Leon, 2000). Carib grass is a fast growing grass that forms dense mats within two months after planting stems or stolons cuttings. The cuttings can be either broadcast, and then incorporated into the soil with the help of livestock, or drilled in the soil at 10 cm depth. The best planting period is during the rainy season as carib grass requires high soil moisture for good establishment (Kretschmer et al., 2001). Carib grass is harvested by cutting or grazing. Depending on the time interval between cuttings (from 45 to 90 days), yields range from 11 to 57 t/ha of fresh matter per cutting, (Rodriguez-Carrasquel, 1983). However, up to 175 t/ha of fresh matter was obtained in Costa Rica (Gonzalez et al., 1970 cited by Skerman et al., 1990). Cattle should enter the sward when carib grass reaches 0.5-0.6 m in height and they should graze only once (Skerman et al., 1990). From the few references available, carib grass appears to have a relatively poor nutritive value, with a protein content ranging from 5 to 10% DM, and up to 12% DM under high levels of N fertilization (725 kg N/ha) (Vicente Chandler et al., 1974). The lignin content is relatively high (about 8% DM). Carib grass was reported to contain high levels of manganese (about 500 mg/kg DM in average) in Mato Grosso do Sul (Brazil) in the early 1980s, a level that can be toxic to cattle if fed for a long period (Prada et al., 1983). Literature on carib grass is very limited. It has been reported as very similar to Para grass but more palatable (Göhl, 1982). Most of the literature concerns stocking rate recommendations for beef cattle. In Puerto Rico, the stocking rate of carib grass for 270 kg steers was estimated at 7.8 head/ha/year when cut every 40-60 days or at 5 head/ha/year when grazed, enabling 1000 kg of live-weight gain/ha/year in the latter case (Vicente Chandler, 2001). In Florida, a stocking rate of 3.2 head/ha/year for 400 kg steers or 5.7 head/ha/year for 230 kg young bulls sustained 877 kg/ha/year of live-weight gain, a higher value than for Para grass (840 kg) (Rodriguez-Carrasquel, 1983). In Colombia, carib grass pasture sustained 500 g/d live-weight gain with a stocking rate of 2-3 head/ha (Corpoica, 2013). In semi-arid Rajasthan (India), carib grass is grazed by goats or sheep, generally in association with other desert plants on community grazing lands (Sankhyan et al., 2007; Bhatta et al., 2002). In this region, carib grass represented 34% of the botanical composition of pastures and 21% of the diet composition of pregnant ewes (Sankhyan et al., 2007).